Our Marrow Miner demo at TED -- quickly harvesting life-saving bone marrow with minimal pain to the donor. See a step-by-step animation of how the MarrowMiner works to harvest significantly more stem cells in a shorter time period. 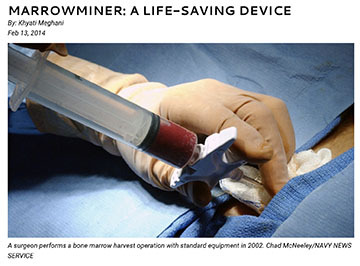 See the MarrowMiner in action harvesting bone marrow with its patented flexible attachment. MarrowMiner: A Life-Saving Device | Helix Magazine - Have you ever wanted to save a life? If the answer is yes, then read ahead!